Even when addressing the most basic womenswear pieces, the 4 Moncler Simon Rocha line, collection n°4 of the Moncler Genius project, takes advantage of its know-how, adapting it to the classic and sophisticated woman who always stands out. 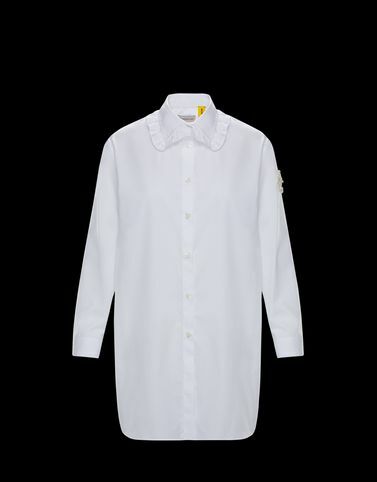 This cotton shirt, an essential piece of the female wardrobe, takes on the character of a sophisticated garment thanks to the ruffle detail on the collar. Because even the most loved basics should bear the brand’s signature of excellence. Wash max 30°C; Do not bleach; Do not tumble dry; Ironing maximum temperature 110°C - without steam; Do not dry clean; Professional wet cleaning; Dry flat; Wash separately; Do not iron decorations; It is advisable to wash and iron with the garment on reverse.